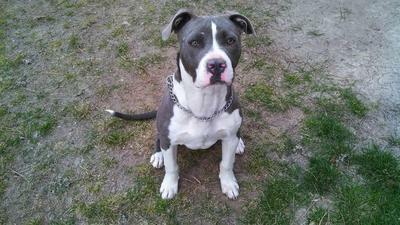 Tank is a 7 month old pure American Pitbull Terrier, BLUE NOSE. He's a happy dog. I rescued him from an abusive home where he was beaten and left to starve. I have only had Tank for a short amount of time. I'd say he is the best dog that I have ever brought into my house. I have 2 small children. their ages are 3 and 3 months. He is wonderful with them. Being a family pet was meant for him. He's the most loveable dog. This is my first pit bull. And now that I understand the breed, I will never own another breed. They are the best breed out there and I would recommend them to all families looking for a furry family member.